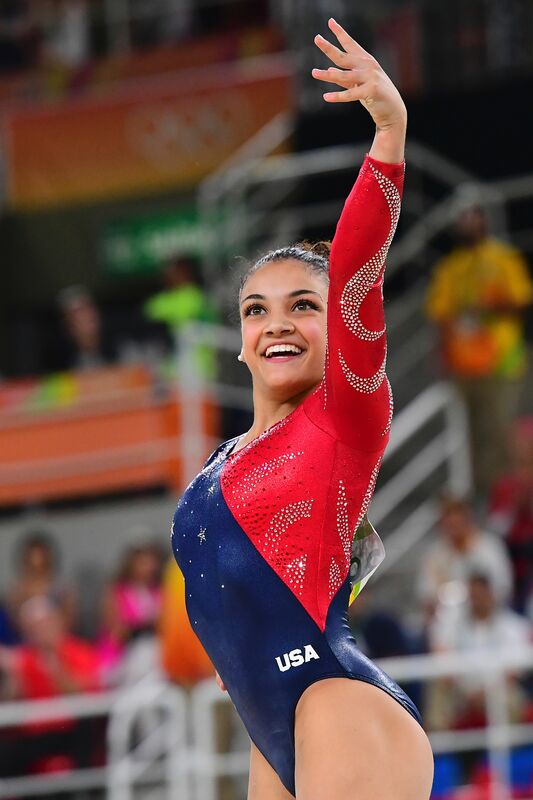 The "Final Five" may have won the gold medal in gymnastics for Team USA, but it's gymnast Laurie Hernandez who is winning the 2016 Rio Olympics. Hernandez has captured the Internet's heart with every facial expression, living up to her nickname, "The Human Emoji." While Michael Phelps had #PhelpsFace and Lilly King made headlines for her finger-wagging, Hernandez is undeniably taking over the Internet thanks to her wink to the judges before her floor routine, as well as three words — "I got this" — she told herself before her beam routine to get pumped. In her very first Olympics, the 16-year-old Hernandez is the meme the Rio games is looking for. Not only that, but Hernandez is also the star social media needed. She's now America's newest Olympic sweetheart, who is earning her own memes just like another gymnast, McKayla Maroney, who at the 2012 Olympics made it clear she was not impressed. But, America is impressed by Hernandez, only the second Latina to make the U.S. team since 1984 and they're making that clear with their own memes and GIFs for her and her wink seen 'round the world. Whether it's a wink for the judges before she started her routine, or a wink that was just for the cameras after seeing her score, it's a moment that the Internet wanted to relive over and over. It's sweet to see this teen act like a teen, even if she's an Olympic gold medalist. As Vulture pointed out in one perfect GIF, Hernandez was the most animated on the Olympic podium, and she looked like the happiest girl in the world as she received her first medal. But it's not just that wink and her overall excitement that has us all wanting more, it's now her "I got this" mantra that seems to be inspiring a nation. One Twitter user said she was "adopting" the phrase and would be using it when "doing anything that scares me from now on." Another said it was the new way she was going to tackle every workday, with a wink and a smile. Not to mention, that it spawned a whole lot of "when you" memes that will help you through any bad day. The Twitterverse has described Hernandez's moment before her balance beam routine as a sign of confidence, a way to make you cry and the "purest thing" they've ever witnessed. And that's why it seems so special: It doesn't seem like some staged moment, it just stands for the pure joy this young woman felt as she took the world stage. How can you not feel overwhelmed with happiness to watch Hernandez be the champion she's trained so hard to be? Amazing. As one Twitter user said, "I just want Laurie Hernandez to walk around with me all day and wink at me when I need a little pick-me-up." And I agree, the Olympics need to put a camera on Hernandez to catch her every facial expression. To catch the moment where she gives herself another pep talk that could inspire a country. Hernandez is everything we wish we could be, and now it feels like we could be that person with just a wink and an affirmation. Gold medal, of course, not included.